How many times have you sat down at your computer to fiddle around for a few minutes, returning to the real world hours (or days) later. This is not always a problem and I don't mind being splattered with cold suppers, missing parties, or aggravating my wife. But one night, I had some free moments to ponder the problem of losing track of time. Wouldn't it be great, I thought, if I could always have the correct time on the screen. I knew that my PET had a 1/60 second counter which is updated during the internal interrupt cycle and some routines to print out the time. 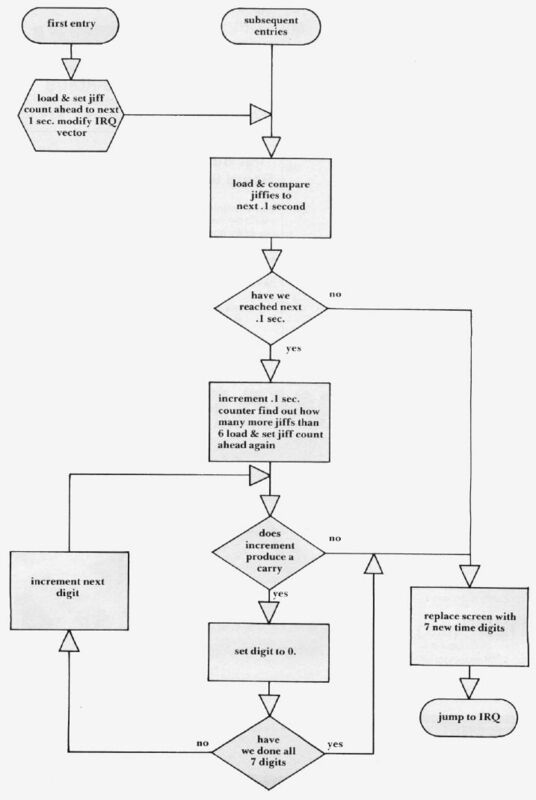 I started to study the memory map in Osborne's PET/CBM Personal Computer Guide and found the following items: jiffy memory, clock correction routine and the location of the interrupt addresses. I figured if I could revector the interrupt through a small machine language program, I could capitalize on all three items – the jiffy clock to keep track of time, the interrupt addresses to return to the correct location and the clock correction routine to make up for the lost time of my program, if necessary. Some other investigation showed that the routines that print the TIME$ use a lot of processing time and interact with memory locations that Basic uses. I figured it would be best to handle it completely as a separate little program. Then, the more I thought about it, I realized that once the time was set, I could follow it with a simple series of little counters rather than keep having to do long divisions. This also has the advantage of being able to jump back to the normal program whenever there is no carry up to the next most significant clock digit. This saves over 50 percent of the time penalty of the screen clock. To initialize the clock and load the machine language program, I wrote a small BASIC program. You can follow the explanations in the flowchart and the symbolic listing of the machine language program along with the listing of the BASIC program. The machine language program is short enough to load with pokes rather than entering it using the machine language monitor. You can enter and run this as a normal basic program and, while the clock is running, you can use most BASIC programs. There is a small time penalty to use this while running BASIC, but if you are programming or game playing, it is not critical. Incidentally, since the program is synchronized with the jiffy counter, you are automatically using the PET's internal correction routine. On a three hour run against a stop watch, the PET gained two seconds (so much for my stop watch). Two words of caution when you are writing programs: first, if you hit return on the line the time is on it will be entered in the listing and, second, if you have to load a program from the cassette, turn the clock off (POKE 144, 46:POKE 145,230), load the program, and start the clock again (POKE 144,74:POKE 145,3). To reset the clock poke the correct time digits to locations 833-838. Note 1: The reason that five is added to the jiffy count and not six (to get the next 6/60 or .1 sec) is that we are incrementing when the prior count location is less than the jiffy count. If the increment occurred on equality then you would add six. The reason for this is that I do not know if the jiffy count can count two sometimes in which case the equality would not occur for up to 12.8 seconds — when the same binary digit again occurred. This is also the reason the program checks for more than six counts.